Has anyone used Issuu to epublish? If so, what do you think? Is there anything opensource like Issuu? I’d rather run something on my own server, but I understand these can be embedded into a website. Lots of new writings, new art, new music. I’m finishing up my art interviews with artists (the creativity series) and a short (!) book review. These are the dog days of summer, is it any wonder that everything seems to droop a little? 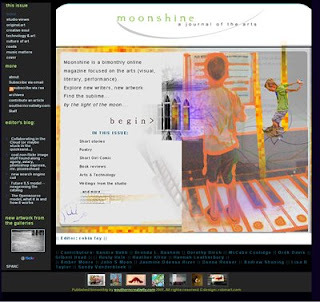 Stay inside in the cool and check out the latest writings, music, paintings, photography… Moonshine celebrates a milestone, which would not be possible without the wonderful artists and writers who share their thoughts, writings, and art. Read, see, and listen! “Don’t you Miss the Farm?” Thoughtful poetry from Brenda L Basham (Bloodshed of the Holocaust; Imagination; and Unlock the Power ), Russell Lee Hale I (Knobby Knees; Memories ), John S Moon (World ) and Sandy Vanderbleek (life flow ). Studio views features Sandra Babb’s essay on improvisation, Rolling with the Punch Bowl and Hannah Leatherbury’s audio interview (a podcast) with multi-media artist Sherry Lynn Wood about her latest project to collect mantras via her Mantra Trailer. (courtesy of the Southern Arts Federation). robin fay continues to explore Creativity (pt. 5 in a series, focusing on the artistic process) while Drék Davis explores his own Confessions of a Wayward Artist. Amber Moore jumps into the playful and educational world of the Children’s Museum of the Shoals in Look and DO Touch: Children Learn with Hands-On Activities in Florence, Alabama. Lori Lejeune gets creative with 3D digital art in From the Studio: An Exposition on 3-d Digital Artistry and Donna Rosser aka The Barefoot Photographer shows us how to take our photos to the next level with Lensbaby in Getting Creative: Your Photography and a Lensbaby. Book reviews for August are Southern Comforts: Rooted in a Florida Place by Suyde Cauthen, a memoir of growing up in the South, and Garden Spells by Sarah Addison Allen, a magical novel set in North Carolina. Music matters features a review of The Rest of the Year , the new CD from the Georgia folk trio, the Solstice Sisters. Hannah Leatherbury talks with Charles “Wsir” Johnson about the necessity of knowing how to repair and create his own instruments while living in a rural community as well as his experience getting commissioned by Chuck D. (from Hannah Leatherbury, courtesy of the Southern Arts Federation). If you’re on this list in error, please do let us know, so that we can remove you from the list (and sorry for any inconvenience). One upgrade, some code tweaking, and voila…. the latest issue of moonshine arts magazine is live. I’m going to add this to my e-zine list, but I think this e-zine template for wordpress looks really good. You are currently browsing the archives for the e-zine category.